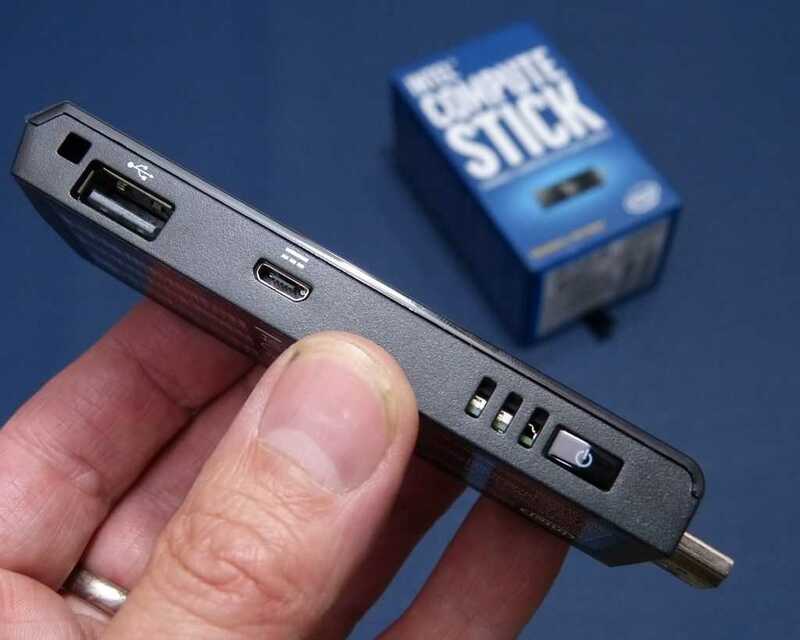 If you’re familiar with 8-inch Windows 8 tablets the Intel Compute Stick is exactly that but without the screen and battery. There’s a micro SD slot, micro USB and, sticking out of the end, a full-size HDMI connector. Importantly there’s an extra, full-size USB 2.0 port. It’s important because it supports USB data + power, unlike all the cheap Windows tablets which use one micro USB port for either power OR data (*1.) Inside the Compute Stick there’s a quad-core Baytrail-T (Z3735F) processor, 32GB RAM and 2GB memory. WiFi-N and Bluetooth 4.0 are included. You won’t find any audio ports so you’ll need to use HDMI, Miracast or Bluetooth connectivity for that. There’s a tiny fan inside. In total, including power supply, HDMI and USB charging cable it weighs 183 grams / 0.4 pounds – as much as some smartphones, without their USB charger. Given the lack of battery and screen it’s obviously not a smartphone or a mobile PC although one could argue that it can be powered by a USB power-pack and accessed remotely. Intel provides a remote keyboard/mouse application for Android and IOS and you’ll be able to screencast to it from other devices via DLNA. Come Windows 10 you’ll be able to remotely start applications using the DIAL protocol too. (think about PowerPoint presentations, Netflix, Groove Music and the like.) No, it’s not really a mobile PC, it’s a portable PC and one you might just want to put in that box of adaptors you take with you all the time. I’ve been thinking about hotel and hot-desking scenarios – situations where screens are often available and all you need is a keyboard and mouse. I’m using a cheap Logitech K400 keyboard with integrated mouse and the total cost is about $180. 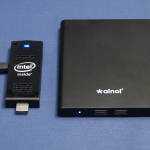 Intel Compute Stick with Logitech K400 USB keyboard. Web-workers tend to keep their data in the ‘cloud’ and use web-based applications. Web working is good way of being mobile, clean, secure and ready to work anywhere and the Compute Stick offers that ability but, unlike a Chrome OS device (like the ASUS Chromebit for example) gives you a vast range of truly local, offline applications, a choice of browsers and deep integration with a Microsoft account, if that’s the way you choose to work. Batch photo processing, local image administration and even a bit of video editing are possible. Back to Web-working and it has to be said that you’ll need to do some preparation before you use an Intel Compute Stick on the road. This applies to all low-end Windows tablets too because the eMMC storage, relatively slow processor and ‘old’ Windows 8.1 build means updates, indexing and anti-virus checks seem to take forever. Updates will take days to filter through and this kills the Windows experience. Make sure you’ve run the stick for a few days, for many hours, before you take it on the road. Comparing the Stick with the SP3. The Surface Pro 3 is a tablet PC I regard as having barrier-free Web-working capabilities. The Ultrabook-style architecture includes strong WiFi-AC, there’s 4GB of RAM, a strong CPU and good connectivity. The Compute Stick doesn’t have anywhere near the processing capability of the SP3 so it’s not a fair competition between the two but the SP3 serves as a very good benchmark that a lot of people have experienced and that’s why I’m testing against it. The full-size USB 2.0 port opens up possibilities. One of the big issues with the Compute Stick is the WiFi. It’s not a dual-band, dual channel WiFi AC module as on the Surface Pro 3. Working with 2.4Ghz and a 150 Mbps connection means you’ll have to be careful to get a good strong signal. A busy WiFi environment will quickly kill the web experience as will a wall. The reception quality on the Stick is basic; probably in the lower 30% of devices I’ve tested recently. Adding a good quality USB WiFi stick could really help but in order to take the network out of the equation in the tests I also ran some tests using a USB 2.0 Gigabit Ethernet adapter. 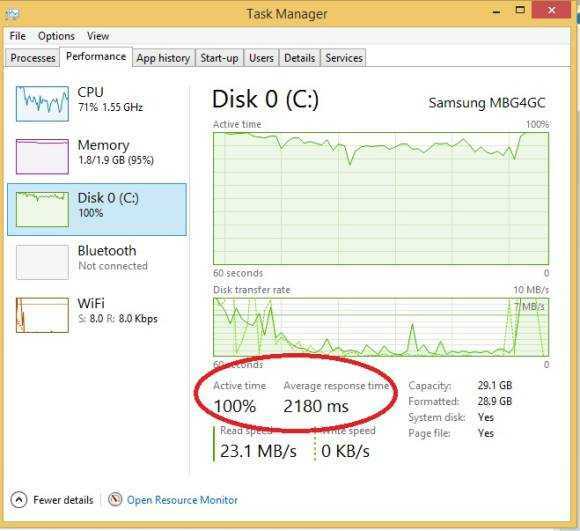 I tested three different Web page load times using the Surface Pro 3 and the Intel Compute Stick. I was connected to an in-room hotspot with strong up/down speeds, AC capability and just a few other users. Page A – a lightweight news page. Page B – an ad and tracker-heavy article. Page C – was an ad-free Google Sheets application. Times in seconds. Average over 3 non-chached page loads. Chrome pre-caching disabled. The Surface Pro 3 was only tested using WiFi-AC. Ad-heavy sites will need to be ad-blocked. In the ad-heavy page B test the load-time was reduced by 30%. Increasing the bandwidth didn’t help much though. For simple web pages there’s little to be gained from adding a Gigbit Ethernet port, but it doesn’t hurt. Just remember that you only have one USB port. 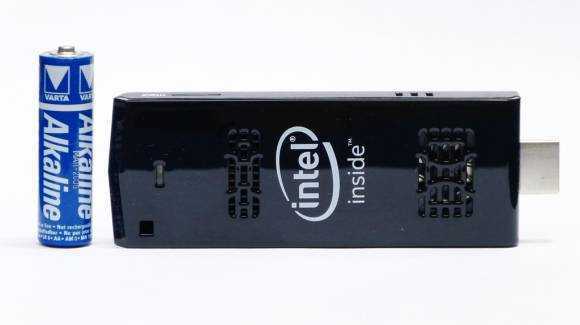 The Intel Compute Stick as a web-working solution. The Compute Stick, as with other quad-core / Baytrail-T Windows devices, isn’t a good solution for productive online applications usage. A dual-core Baytrail-M Chromebook is likely to out-perform the Compute Stick in this scenario and offer better default security and privacy, assuming you trust Google. Before you decide that the ASUS Chromebit is a better solution, consider that it’s likely to run a quad-core Rockchip CPU and not a dual-Core Intel Baytrail-M CPU. Performance in web-working scenarios may suffer. When dealing with ad-heavy pages the Compute Stick struggles but an ad blocker helps. I used Ad Block (not Ad Block Plus, whose business model I don’t support) in this scenario. If you’re reading long-form content I recommend using Metro IE / (Edge in Windows 10) and its reader function. Apps like Flipboard, Bing News and Nextgen Reader might help any might even work offline. 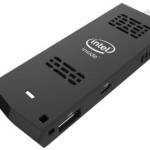 For simple websites the Intel Compute Stick is more than enough and one must consider that although it can be slow, it will deliver the full Web experience. Pretending to be a mobile browser can help with speed, layout and can drastically reduce data requirements which helps the Compute Stick on every level. I re-tested site A, a fast, simple page, using the Chrome UA Spoofer extension set to Android KitKat alongside the Ad Block extension and saw page load times reduce to 1/3rd of what I could achieve over Gigabit Ethernet. For content reading this is the answer. For web applications, it’s not such a great solution but might help in some cases where applications are well optimized for mobile browsers. One last thing you can do to help your experience, especially with large, image-heavy sites is to use the Google Data Saver extension which will proxy all traffic through its servers doing compression on the way. This won’t help much for mobile sites but on desktop sites you’ll save a significant amount of data. Data Saver (and similar compressing proxy services) could help to overcome a weak WiFi signal and could, depending on the speed of Google’s servers, save time. Don’t use this solution for web applications or sensitive data. I opened Google News and started loading the pages as they appeared on the News site. 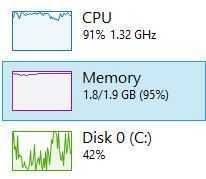 Opening multiple pages concurrently brings the CPU to its knees but after a while I managed to get 10 tabs open before the performance monitor indicated some disk and paging activity. After the 12th tab loaded I tried to open Google Music – an online application that can take a lot of memory. I was surprised that it opened but there was clear paging activity which indicates the end-of-the-road for PC performance. After this point things don’t get any better at all and in general, unusable. When the disk is taking 2 seconds to respond you know you’ve reached the limits of your PC! The Windows tablet PC security guide here will help you with security and privacy. One point to note here though is that the Compute Stick does not support OS-based Bitlocker file encryption. Most other Baytrail-T / Windows 8 PCs support Bitlocker but the TPM module is missing from the Stick hardware. It might be possible to implement Bitlocker under Windows 10 using virtual TPM but details are not readily available at this time. The Intel Compute Stick supports Web-working but not in the way that a productive office worker might expect. The Stick takes 2 times as long to load a web page on average and has limits to the amount of concurrent pages that can be opened. There’s no disk-based encryption. For the average user it’s just not fast enough to use on a daily basis. 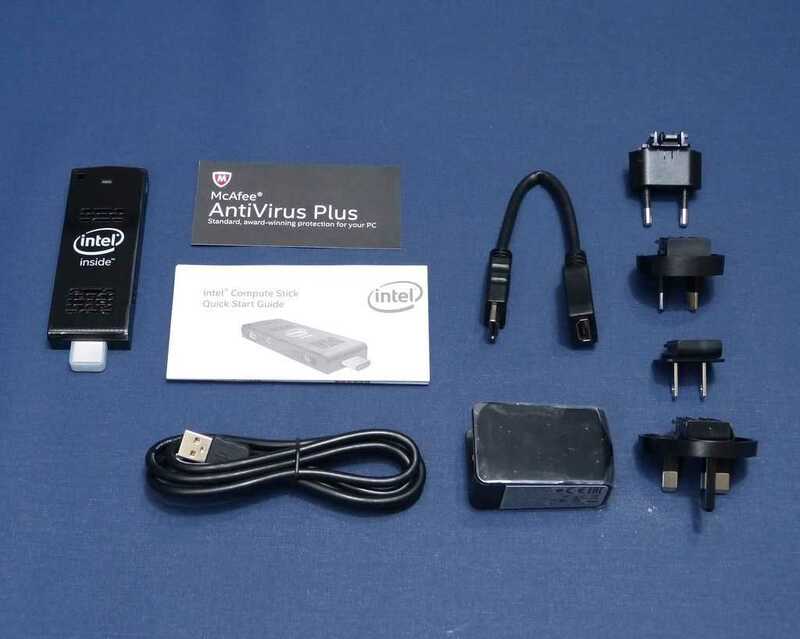 The Intel Compute Stick is not a self-contained PC either. You’ll need a keyboard-video-mouse solution to use it just like you would any standalone PC so considering that some 10-inch low-cost Windows tablet solutions offer everything that the Compute Stick does, for just $50-$80 more with a screen, battery and even a keyboard in some cases there’s another limitation. But try and find a sub-400 gram solution with HDMI, USB and power. In most cases there’s no HDMI port and in nearly all there’s a USB port that is also used for charging. You’ll need to move up to the 10-inch Windows tablet group before you find a self-contained unit with the same port/power capability as the Stick and then you’re looking at something that weighs 10 times the weight of the Stick. The Stick is currently $149 but Archos have already announced a similar product that will retail for much less than that and when we reach $99 it becomes slightly more interesting as a back-up solution, as long as you’re happy with the data and physical security. Where the Intel Compute Stick could shine is in developing markets. A fully-licensed Windows PC at this price and size is unique. The Stick performs as well as a four year old laptop and much better than the netbooks of 5+ years ago. 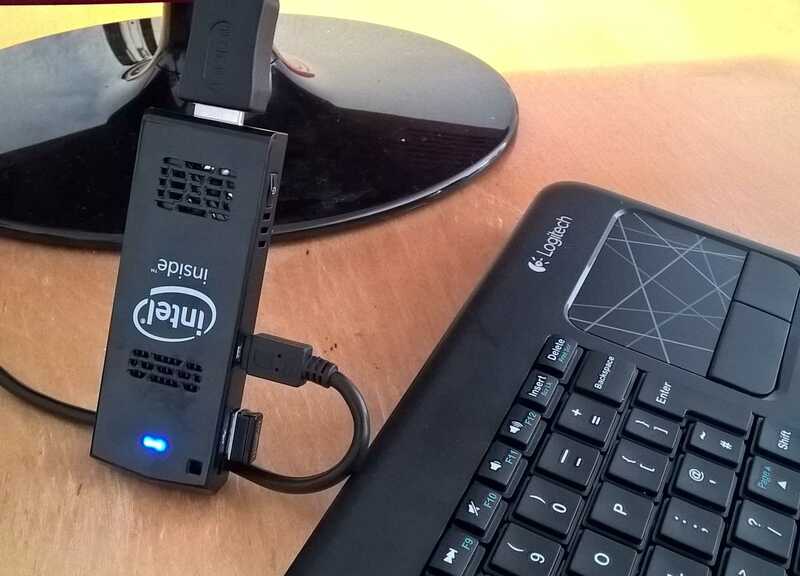 The Stick can run for hours, possibly days on a backup power supply and you have complete flexibility to build a workstation with a Gigabit Ethernet adaptor, external hard drive and even add a 3G stick for internet connectivity. I’m thinking about journalists I met in Ukraine last year as one of the perfect customers for the Compute Stick. [Journalist without Euros.] The Compute Stick could have a place in developing education markets as a web-computer too. Think outside the web-working scenario and you have disaster recovery, signing and advertising, data collection and lots more that I haven’t covered in this article. For the lucky ones among us, the Compute Stick is a fun building-block and the lightest backup PC ever but for those with reduced budgets this could be much safer, much more efficient and much faster than second-hand PC solutions in web-working scenarios. Think, too, about low-cost educational software, written for Windows 10 Mobile, running on a desktop screen. If you’re assessing the Compute Stick, or a variant of the Compute Stick for education, developing markets or other scenarios I’d love to hear from you. I’m sure everyone else would too so please take a moment to let us know what you’re working on in the comments below. Thanks! 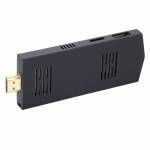 *1 – You can buy special power-injectors for some Windows 8 tablet solutions. iConsole Micro. The $129 Atom-powered Android stick. Small computers are nice, but only if you need mobility/to travel. 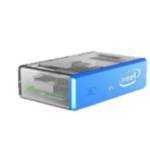 A dual core Intel core based chip like a celeron G1840 costs €35,- and gives you a tremendous performance boost. Even for our HTPC’s we use core’s instead of atom’s. Speed is much beter even if you do get a bigger PC. I would just not advise atom based devices if you can avoid them, i.e., can go intel core based. For work and/or pleasure. My phone (Asus Zenfone 2) does run a Atom. I would add that if fanless / silent capability is important you also need to look at Arom. Total price for a Core based miniPC Is also going to be more than this stick. I’d like to connect a USB 3.0 drive to it. Act as a good enough HTPC and NAS. Losingthewires offers TPM equipped stick-PCs running Windows 8.1 or 10 Professional. Each has 2 x USB and Audio as well as SecureBoot and UEFI security (passwords, disable USB boot etc.). Bitlocker (TPM+PIN) works very well and is available as it’s Windows 8.1/10 Professional (standard 8.1 only supports device encryption which is not the same thing). Virtual TPM isn’t needed as TPM 2.0 (Intel PTT) is built in. Designed to be used by corporates who want to offer low cost corporate owned devices for use as home/flexible working solutions – simply plug into monitor, keyboard and mouse and VPN over Wi-Fi etc. Audio port, missing on most Stick-PCs, makes it ideal for Lync for Business etc.